How to Make Tempeh Bacon- a simple method for making tempeh bacon at home. 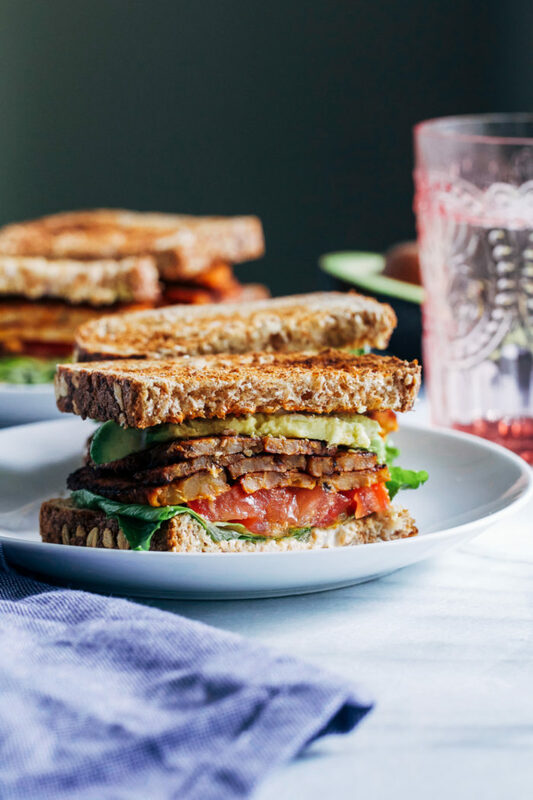 Perfect for tempeh BLTs all summer long! 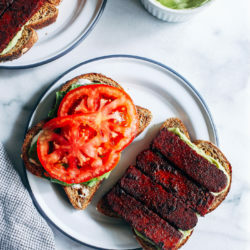 Anyone else been eating tempeh BLT’s like they’re going out of style? They’re my go-to sandwich in the summertime. Such a perfect way to put those ripe juicy tomatoes to good use. 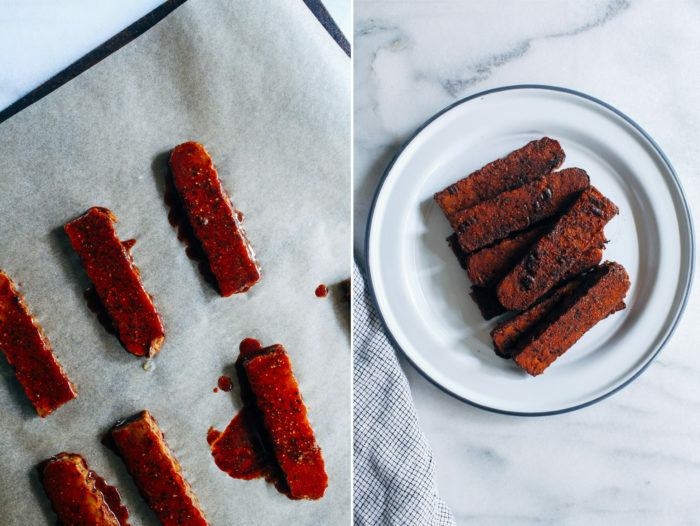 While Lightlife’s fakin bacon is usually my go-to when I’m in a pinch, I also like to make my own tempeh bacon on occasion. Mainly because I like variety and try not to eat soy every single day. 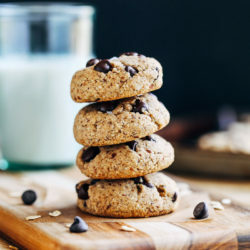 I’m not hating on soy, I just like to mix things up because there’s so much varied research out there. I figure if I eat it in moderation then I’m good either way. 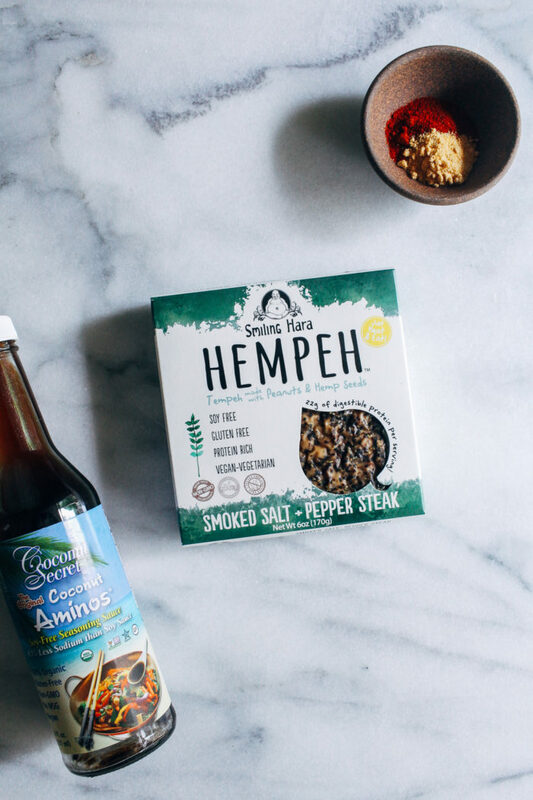 What’s awesome is that there’s a local company called Smiling Hara that makes some pretty amazing soy-free tempeh. I’ve had some made with chickpeas, black beans and even black eyed peas. Those versions are a little harder to find but their hempeh (made from hemp seeds and peanuts) is always in stock at my nearby health food store. You’ll find a lot of tempeh bacon recipes called for liquid smoke but I know it’s not a common ingredient to have on hand so I made mine without. In it’s place I used smoked paprika which still gives off that delicious smoky flavor. Soy sauce is also a common ingredient used in the marinade but to keep the recipe soy-free you can use coconut aminos in it’s place. If I’m using tamari (which is just gluten-free soy sauce) then I’ll also add a touch of pure maple syrup. However, I personally find the coconut aminos to be naturally sweet so I usually forgo the syrup if I decide to go that route. Outside of smoked paprika and coconut aminos, all you need is garlic powder, rice wine vinegar, and salt & pepper. I always have these in my pantry so all I have to do is grab some tempeh and go. 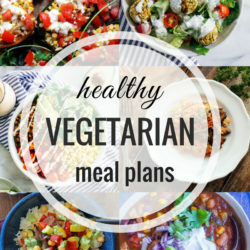 I listed two different methods for cooking the tempeh below. One is an oil-free option that involves baking it and the other is the standard method of frying it in the skillet. I prefer the latter because I think it tastes a lot better and I’m not really worried about my oil consumption. But I thought I would test both ways for my oil-free peeps out there. 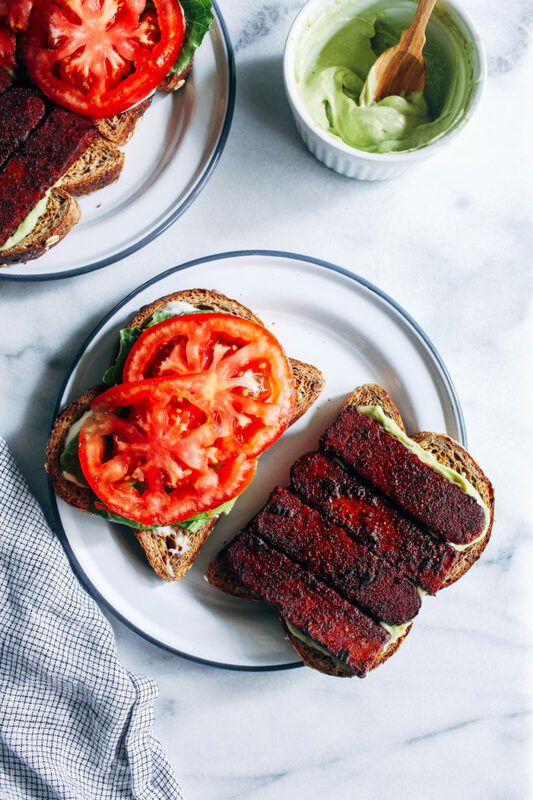 To make the ultimate tempeh BLT, make sure you have some high quality tomatoes (preferably home or locally grown), crisp romaine and, my personal favorite, creamy avocado. Which would technically make it a tempeh BLAT. They are so dang good! Place the tempeh in a steamer basket over boiling water. Cover and steam for at least 5 minutes. Remove from heat and set aside. 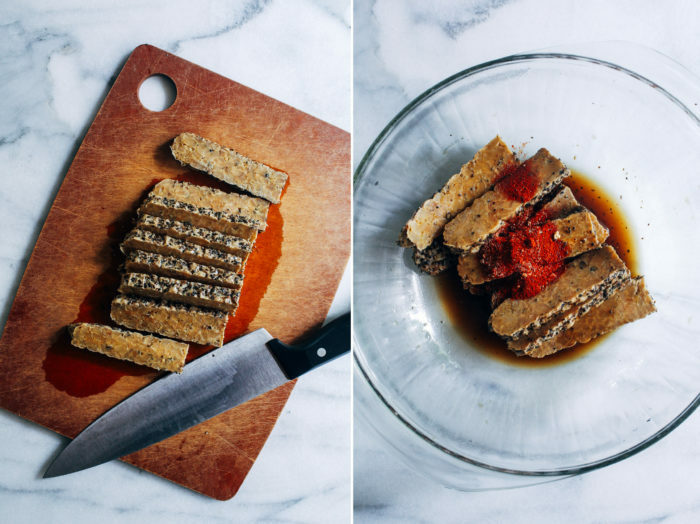 Once cool enough to handle, slice the tempeh into strips 1/4-inch thick strips. Transfer to a large shallow bowl then pour in the coconut aminos and sprinkle with smoked paprika, garlic powder and salt & pepper. Stir until evenly coated. Allow to marinate for at least 30 minutes, or up to 2 days. If marinating overnight, make sure the bowl is tightly sealed. In a large skillet, warm a few tablespoons of oil over medium-high heat. Cook the tempeh for about 5 minutes on each side, until edges are slightly crisp. The texture will not be crispy like real bacon but the edges should crisp up a little. Alternatively you can bake the tempeh on a lined baking sheet at 350°F for 10 minutes on each side. This is a great oil-free option, however the flavor and texture isn’t quite as good. *You can use soy sauce (or tamari) instead of liquid aminos. If using soy sauce you may want to add a little bit of pure maple syrup. I find the liquid aminos to have a slight sweetness to it so it’s not really necessary if you’re using that, although you could add some if you like. **If using preseasoned tempeh (like this salt & pepper version that I used) then you may want to omit the salt & pepper or add it to taste. This looks amazing. I love Sweet Earth’s bacon, but this looks much more substantial! If I ever get the motivation to make my own, I’ll definitely save this one! 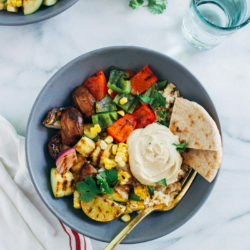 Giiiiiirl, you’re making my mouth water with your tempeh! That sandwich looks absolutely amazing. 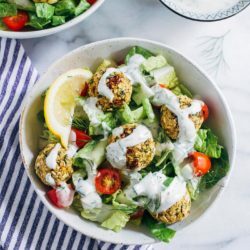 I seriously need to try your tempeh tricks! 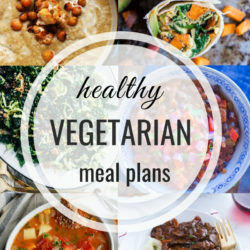 Ahhh I am becoming a vegan! And all by accidentally finding your website! Just ate my first vegan BLT and it was freaking awesome! Oh yeah, BLATs are one of my go-tos when I need a quickie dinner – and I use the fakin’ bacon as well! I’ll have to try this out for a more homemade version.